Enhanced vMotion Compatibility (EVC) is available for a while now, but it seems to be slowly adopted. Recently VMguru.nl featured an article “Challenge: vCenter, EVC and dvSwitches” which illustrates another case where the customer did not enable EVC when creating the cluster. There seem to be a lot of misunderstanding about EVC and the impact it has on the cluster when enabled. VMware Enhanced VMotion Compatibility (EVC) facilitates VMotion between different CPU generations through use of Intel Flex Migration and AMD-V Extended Migration technologies. When enabled for a cluster, EVC ensures that all CPUs within the cluster are VMotion compatible. Because EVC allows you to migrate virtual machines between different generations of CPUs, with EVC you can mix older and newer server generations in the same cluster and be able to migrate virtual machines with VMotion between these hosts. This makes adding new hardware into your existing infrastructure easier and helps extend the value of your existing hosts. Well, this is not entirely true; EVC creates a baseline that allows all the hosts in the cluster that advertises the same feature set. The EVC baseline does not disable the features, but indicates that a specific feature is not available to the virtual machine. Now it is crucial to understand that EVC only focuses on CPU features, such as SSE or AMD-now instructions and not on CPU speed or cache levels. Hardware virtualization optimization features such as Intel VT-Flexmigration or AMD-V Extended Migration and Memory Management Unit virtualization such as Intel EPT or AMD RVI will still be available to the VMkernel even if EVC is enabled. As mentioned before EVC only focuses of the availability of features and instructions of the existing CPUs in the cluster. For example features like SIMD instructions such as the SSE instruction set. Let’s take a closer look, when selecting an EVC baseline, it will apply a baseline feature set of the selected CPU generation and will expose specific features. If an ESX host joins the cluster, only those CPU instructions that are new and unique to that specific CPU generation are hidden from the virtual machines. For example; if the cluster is configured with an Intel Xeon Core i7 baseline, it will make the standard Intel Xeon Core 2 feature plus SSE4.1., SSE4.2, Popcount and RDTSCP features available to all the virtual machines, when an ESX host with a Westmere (32nm) CPU joins the cluster, the additional CPU instruction sets like AES/AESNI and PCLMULQDQ are suppressed. As mentioned in the various VMware KB articles, it is possible, but unlikely, that an application running in a virtual machine would benefit from these features, and that the application performance would be lower as the result of using an EVC mode that does not include the features. When EVC is enabled in vSphere 4.1, DRS is able to select an appropriate ESX host for placing FT-enabled virtual machines and is able to load-balance these virtual machines, resulting in a more load-balanced cluster which likely has positive effect on the performance of the virtual machines. More info can be found in the article “DRS-FT integration”. Equally interesting is the building block approach, by enabling EVC, architects can use predefined set of hosts and resources and gradually expand the ESX clusters. Not every company buys computer power per truckload, by enabling EVC clusters can grow clusters by adding ESX host with new(er) processor versions. One potential caveat is mixing hardware of different major generations in the same cluster, as Irfan Ahmad so eloquently put it “not all MHz are created equal”. Meaning that newer major generations offer better performance per CPU clock cycle, creating a situation where a virtual machine is getting 500 MHz on a ESX host and when migrated to another ESX host where that 500 MHz is equivalent to 300 MHz of the original machine in terms of application visible performance. This increases the complexity of troubleshooting performance problems. The Nehalem Hyperthreading feature is officially called Symmetric MultiThreading (SMT), the term HT and SMT are interchangeable. 1. An Intel Nehalem processor often called a CPU or package. 2. An Intel Nehalem processor contains 4 cores in one package. 3. Each core contains 2 threads if Hyperthreading is enabled. 4. A SMT Thread equals a logical processor. 5. A logical processor is translated in esxtop as a PCPU. 6. A vCPU is scheduled on a PCPU. 8. LLC= Last Level Cache: Shared by Cores is last on-die cache memory before turning to Local memory. 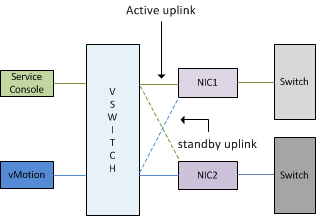 During placement of a vSMP virtual machine, the NUMA load balancer assigns a single vCPU per CPU core and “ignores” the availability of SMT threads. As a result a 4-way vSMP virtual machine will be placed on four cores. In ESX 4.1 this virtual machine can be placed on one processor or on two processors, depending on the amount of cores on the processor or if set the advanced option numa.vcpu.maxPerMachineNode. When a virtual machine contains more vCPUs than the amount of cores the processor, this virtual machine will span across multiple processors (Wide-VM). The default policy is to span the virtual machine across as few processors (NUMA nodes) as possible, but this can be overridden by an advanced option called numa.vcpu.maxPerMachineNode, which defines the maximum amount of vCPUs of a virtual machine per NUMA client. But as always, only use advanced options if you know the full impact of this setting on your environment. But I digress; let’s go back to NUMA and Hyperthreading. Now the key to understand is that only during placement the SMT threads are ignored by the NUMA load balancer. It is the up to the CPU scheduler to decide in which way it will schedule the vCPUs within the core. It can allow the vCPU to use the full core or schedule it on a SMT thread depending on the workload, resource entitlement, the amount of active vCPUs and available pCPUs in the system. Because SMT threads share resources within a core will result into lesser performance than running a vCPU on a dedicated singe core. The ESX scheduler is designed in such a way that it will try to spread the load across all the cores in the NUMA node or in the server. But basically, If the workload is low it will try to schedule the vCPU on a complete core, if that’s not possible, it will schedule the vCPU on a SMT thread. As mentioned before, running a vCPU on a SMT thread will not offer the same progress than running on a complete core; therefore a different charging scheme is used for each scenario. This charging scheme is used to keep track of the delivered resources and to check if the VM gets it entitled resources, more on this topic can be found in the article “Reservations and CPU scheduling”. NUMA.preferHT=One NUMA node to rule them all? Although the CPU scheduler can decide how to schedule the vCPU within the core, it will only schedule one vCPU of a vSMP virtual machine onto one core. Scott Drummonds article about numa.preferHT might offer a solution. Setting the advanced parameter numa.preferHT=1 allows the NUMA load balancer to assign vCPU to SMT thread and if possible “contain” one vSMP VM into a single NUMA node. 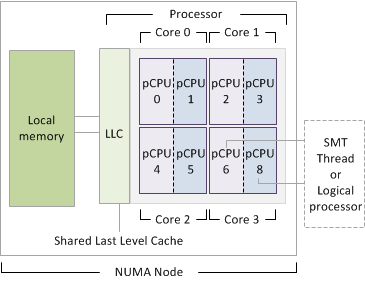 However the amount of vCPU must be less or equal than the amount of pCPUs within the NUMA node. By placing all vCPUs within a processor a virtual machine with a “intensive-cache-footprint” workload can benefit from a “warmed-up” cache. The vCPUs can fetch the memory from Last Level Cache instead of turning to local memory resulting in less latency. And this is exactly why this setting might not be beneficial to most environments. The numa.preferHT setting is a CPU scheduler wide setting, that means that the NUMA load balancer will place every vSMP virtual machine inside a processor i.e. both intensive cache workloads and low-cache footprint workloads. Currently the ESX 4.1 CPU scheduler does not detect different workloads so it cannot distinguish virtual machines from each other and select an appropriate placement method i.e. place the virtual machine within one processor and use SMT threads or use wide-VM numa placement and “isolate” a vCPU per core. It is crucial to know that by placing all vCPU on one processor doesn’t guarantee it to have all its memory in local memory, the main goal is to use LLC as much as possible, but if there is a cache miss (memory not available in cache) it will fetch it from local memory. The VMkernel tries to keep memory as local as possible but if there is not enough room inside local memory, it will place the memory into remote memory. Storing memory in remote memory is still faster than swapping it out to disk but inter-socket communication is noticeable slower than intra-socket communications. This brings me to migration of virtual machines between NUMA nodes, if a virtual machines home node is more heavily loaded than other NUMA nodes, it will be migrated to a less loaded NUMA node. During the migration phase, local memory turns into remote memory. This newly remote memory is moved gradually because moving memory has high overhead. By using the numa.preferHT option forces you to scope the maximum amount of memory assigned to a virtual machine and the consolidation ratio. Having multiple virtual machine traverse the quick path interlink to fetch memory stored in remote memory defeats the purpose of containing the virtual machines inside a processor.